Sir Paul Judge is a true representation of determination and has been awarded an Honorary Doctor of Laws by London South Bank University. Sir Paul studied Natural Sciences and Management at Trinity College, Cambridge, before gaining an MBA at the Wharton School of the University of Pennsylvania. Sir Paul joined Cadbury Schweppes, rising to become the managing director of Cadbury Schweppes Kenya, managing director of Cadbury Typhoo and subsequently group planning director. Sir Paul eventually administered the buyout of their food companies in 1985 to form Premier Brands which was successfully sold in 1989. With a successful career in the food industry, Sir Paul was later appointed to the Milk Marketing Board and as chair of Food from Britain, set up by the government to promote British food exports. In 1992, he was voted Food Industry Personality of the Year and became Director General of the Conservative Party, overseeing a transformation of the party's organisation and a turnaround in its finances. He moved on to become a ministerial adviser at the Cabinet Office, responsible for competitiveness, deregulation, privatisation and information technology. He subsequently set up the Jury Team where he vowed to 'clean up politics' by providing backing and support for high-calibre candidates with no party allegiance. At the beginning of the 1990s, he founded the Judge Business School at the University of Cambridge, which is now ranked among the top 10 business schools in Europe. His keen interest in education is a thread that runs through his subsequent business and philanthropic activities. He is currently an Alderman of the City of London, Chairman of a number of educational charities and a Director of companies in the UK, US and UAE. In 1996 Sir Paul was appointed a Knight Bachelor for his public and political services. On receiving the award, Sir Paul said: "I am very honoured to receive this Honorary Degree from LSBU where I have been on the Advisory Board for several years. The University is clearly developing well and I look forward to assisting with its further progress." LSBU Vice Chancellor David Phoenix commented: "Sir Paul Judge has contributed significantly to promoting the UK's business interests and raising the country's profile abroad. He is a passionate advocate for education and has been committed to making a difference in numerous sectors throughout his career. 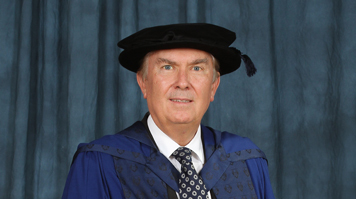 We are delighted to present Sir Paul Judge the award of Honorary Doctor of Laws."